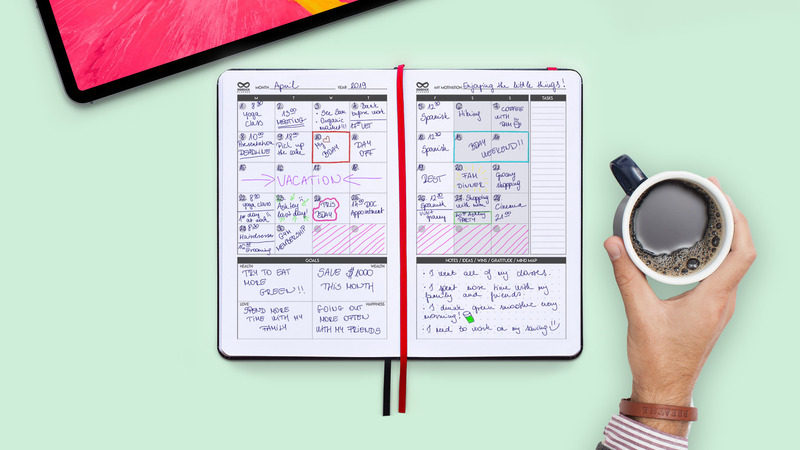 Sidekick Planner is undated, so you can pick up and start using it any time you wish. It has been designed for professionals to daily use to manage their time the most efficiently. Let's take a look inside! Life is way too short. You need to dream big and find the things that you're passionate about. "What am I passionate about?" "What do I like to do on a daily basis?" "Who motivates me in my life?" "What kind of exercise will keep me fit?" "Where do I want to be in 5 years?" "Where can I evolve in my career?" Be creative, and dare to think big! 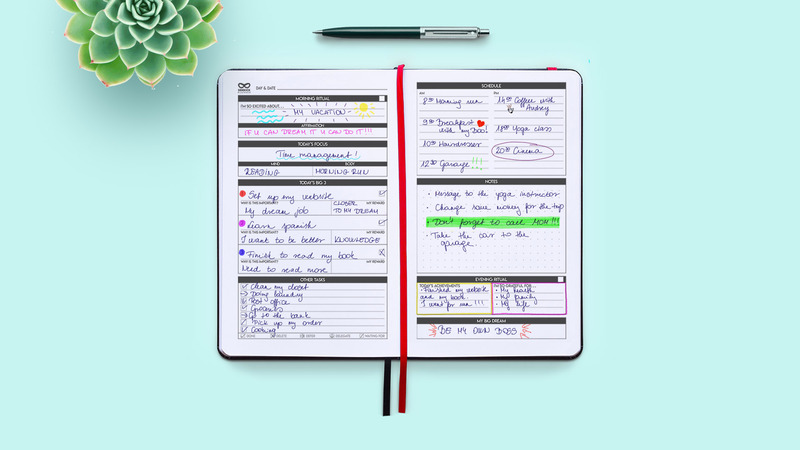 Sidekick Planner is designed to achieve your dreams at one step at a time. On these two pages don't dwell on the details, think bold, long-term goals without worrying too much on the "how". Set your rituals right! But what are rituals anyway? Rituals or on their other names - routines are part of our life. Many things that we do is a routine, and subconsciously we often sabotage ourselves without even knowing about. This is why it's important to make a decision and create our own routines. We divided them into 3 main categories: Morning, Evening, and Weekend Rituals. How we start and how we finish each and every day is vitally important to live a happy and fulfilling life. Think about how you want to start and end your day when you craft your new routines. What habits will bring you closer to your goals? If it brings you closer, and you can do and willing to do it, then implement it! If it's not, simply stop it. "Start the morning with a big glass of water"
"Write down why I'm grateful for"
"Go for a long walk in nature"
"Spend quality time with my family"
"Start to plan next week's tasks"
Create crystal clear goals with the goal setting guide. Goal setting is not easy, but with your Sidekick's well crafted goal setting guide, it will be much more easier. You can set 3 big goals for the upcoming 3 months of your life. And they have to be S.M.A.R.T.! It's an acronym and it means your goal needs to be Specific, Measurable, Achievable, Realistic, and Time band. A goal is worthless if yo don't know your WHY. Knowing why you want to achieve that specific goal will keep you motivated and gives you a reason to wake up every morning and work toward it. These goals can be a small, yet vital step toward your big dream. Such as if you dream to financial freedom, the first goal towards it can be to start your own website, or start a youtube channel. 1) Learn about youtube. 2) Research on topics for my channel. 3) Practice speaking to the camera. As you can see, none of these steps seems unachievable now! Once you done with an action step, just simply thick the box before it and get a great feeling of achievement. It's important to keep yourself motivated! It's critical to reward yourself once you achieve your goal. Write down how you will celebrate and what will be your achievement! The reward also triggers a positive reinforcement, and makes you more confident! Three two-pages layout for the next 3 productive months of your life. Remember, Sidekick Planner is undated, so you can start your journey at any given time. 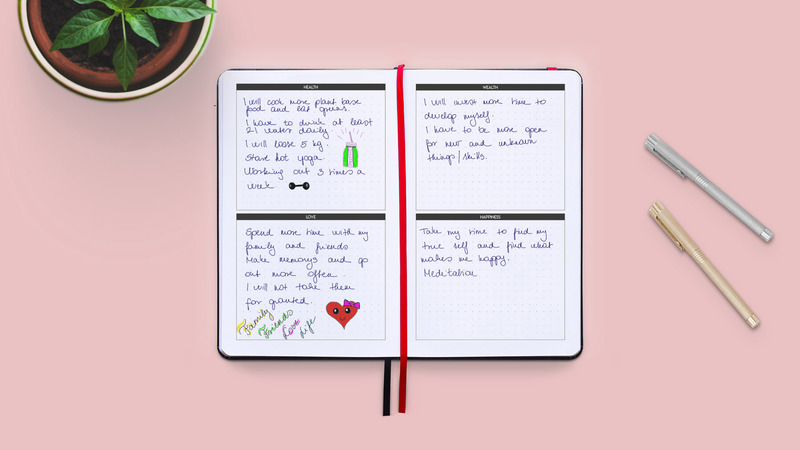 These pages were designed to see your upcoming days at a glance. 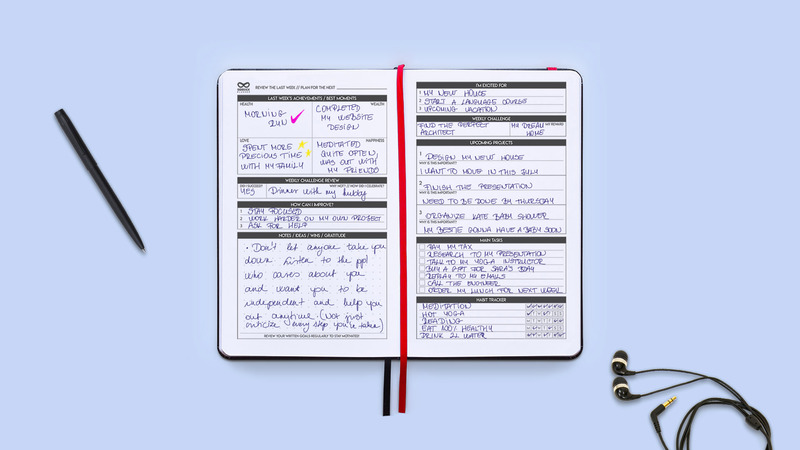 On the right side you can mark your main tasks for each week, so you can always plan ahead. The left side is designed to review your last week's achievement and progress, mark your best memories or progress of each of four areas of your life. If you set a weekly challenge, here you can review that too. Think about how you can improve, what changes you can implement into your life to become a better version of yourself. 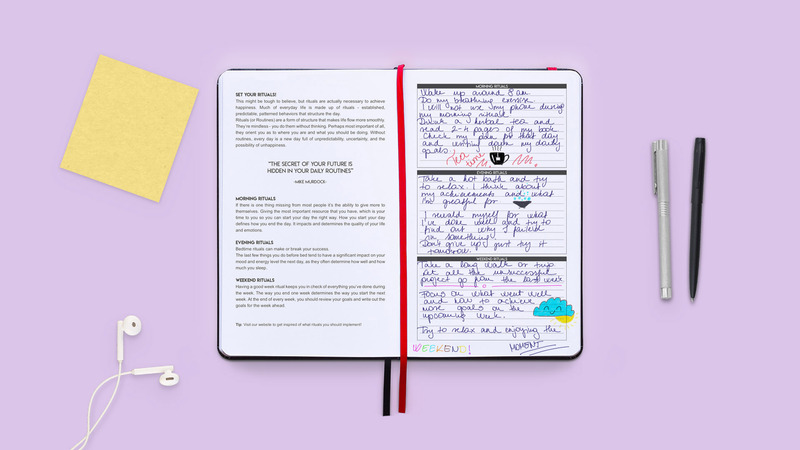 We left plenty of space free for notes, journaling, or anything what comes into your mind. Planning your future is very important. But it can be fun too! Think about what you are excited for and what challenges you want to conquer. Plan out your upcoming projects, and clarify your "why", as it's vital to keep you motivated. 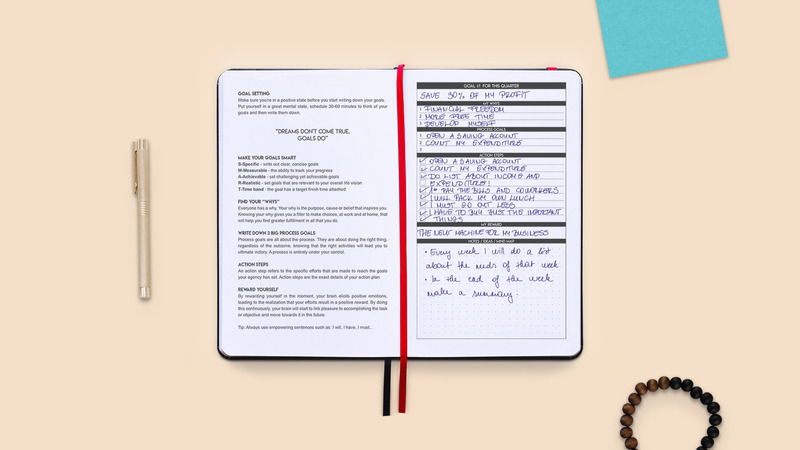 There is also room for your smaller tasks, and at the bottom of the page there is a habit tracker to build new habits and nurture your existing ones. You will find seven, double page in a row for each day! Sidekick's daily layout is a well thought out tool to help you to achieve maximum results in minimum time. You can be really thorough about your day and dive into the details to make sure nothing distracts you from your goals. You can start your day with your morning ritual, and finish with your evening ritual, so you'll never forget about priorities. You can set and achieve 3 big goals each day, as probably any more than that would put you under pressure and would be impossible to manage that many tasks. The schedule section is not predefined, as we know each and every one of us live a different life, so we leave it up to you to schedule your days. At the end of each day, writing down your big dream will really fill you up with excitement for the night, and makes it much easier to wake up on the next morning. That's Sidekick Planner in a nutshell. We are confident you will be in the right path for success and achieve everything and more that you can envision. Start planning today to make your dreams your reality. You'll receive news, tips, discounts, and much more directly into your inbox. Copyright © 2019, Sidekick Planner.